The biopsy samples taken from the prostate gland during a biopsy will be sent off to the laboratory to be analysed for the presence of any cancer. This is performed by scientists called histo-pathologists. They will look at the tissue from the biopsy under a microscope and check for the presence of cancerous cells. Men will usually then be reviewed in an outpatient clinic with the results. Sometimes men who have had an operation on their prostate called a Trans Urethral Resection of the Prostate gland (TURP) may be found to have prostate cancer in some of the prostate tissue that has been removed. If prostate cancer is found to be present it will be evaluated using a special system called the Gleason grading system. This is the standard means of classifying prostate cancer and can give an accurate picture of how potentially aggressive or problematic prostate cancer may be (see diagram below). The cell structure of cancerous cells is different from normal ones and under a microscope this is usually easily identified. Normal cells tend to be a similar size and uniform in appearance while cancerous cells may look haphazard and less distinguishable from each other. The Gleason grading system uses the appearances of the cell structure of prostate cancer to assign a score between 1 and 5 depending on how abnormal the cells appear to be. 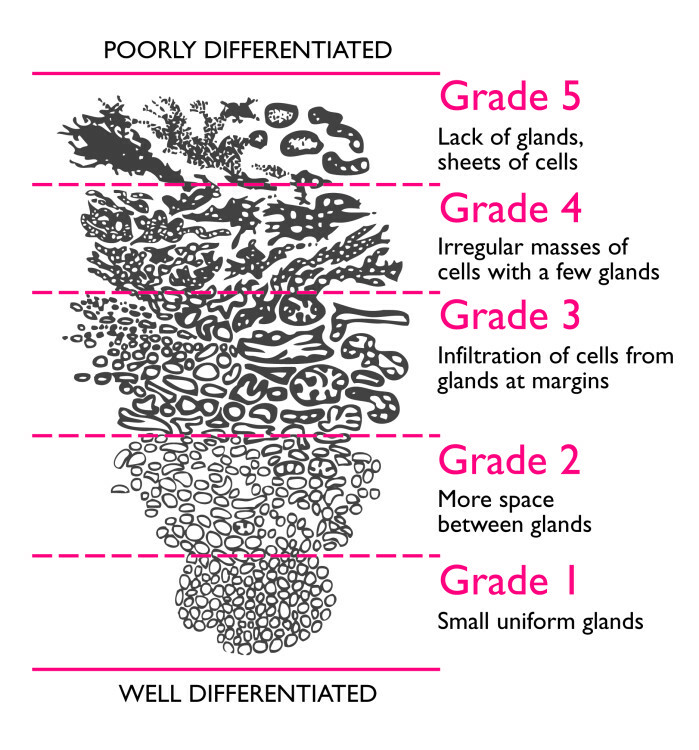 For instance the cells of grade 5 are very abnormal looking compared to grade 3 cells while grade 1 cells are almost normal looking. To get an accurate Gleason score a histo- pathologist will examine biopsies and look for the most common type of cell structure that is present. This will then be given a score between 1 and 5 depending on how cancerous the cells look. They will then identify the next most common type of cancerous cell type that is present and also grade it in the same way. This will give two separate scores out of 5. These scores are then added together to give the overall Gleason score out of 10 e.g. 3+3 (6 out of 10).These days most urologists and cancer specialists feel that the lowest grade of cancer that can be identified accurately on a prostate biopsy without the whole prostate gland being removed, is a Gleason score of 6. A Gleason score of 6 is felt generally to be a slow progressing type of prostate cancer. A Gleason score of 7 (3+4 or 4+3) is usually termed a moderate grade while scores of 8 (3+5, 4+4, 5+3) 9 (4+5, 5+4) and 10 (5+5) are considered potentially more aggressive forms of prostate cancer. A Gleason score of 4+3 is higher than a grade of 3+4. Gleason score 3 + 3 (grade group 1). Gleason score 3 + 4 (grade group 2). Gleason score 4 + 3 (grade group 3). Gleason score 3 + 5 (grade group 4). Gleason score 4 + 4 (grade group 4). Gleason score 5 + 3 (grade group 4). Gleason score 4 + 5 (grade group 5). Gleason score 5 + 4 (grade group 5). Gleason score 5 + 5 (grade group 5). Last reviewed 04/06/2018. Next review 04/12/2018. Please type the code above, so you can submit the form.